Millennials aren’t just consumed by taking selfies, pursuing a side career as a DJ and drinking energy drinks to stay awake while wondering about the next great startup in which they will author overnight. No. They’re more than that. Say hello to the demographic that follows (and dwarfs) Generation X. They are, by default, the future of the workplace. Many leaders in the corner office have already either implemented ways to attract and retain this young talent or are working on customs to become more relevant and relatable in hopes of bringing them on board. But is there truly a little bit more involved than a decent salary and the expected benefits package? Is Generation Y motivated by elements that previous generations simply shrug their shoulders over? John Maketa, co- author of “Leading With Vision”, as well as a nationally respected thought leader and pioneer in innovative leadership, teamed up with David Annunziata, Vice President of Federal Solutions for Performance Assessment Network, to better explain to us how those in a supervisory role can understand today’s young adults in the workforce. DC Life Magazine: How did” Leading With Vision” initially come to be? John Maketa: We wanted to find out what was working and what wasn’t working within the world of executive development. We talked to chief learning officers, senior business line executives, VP’s of HR, vice presidents of training and development and beyond. The number one thing that we found was that creating a compelling vision and engaging others around it was priority for leaders. Number two was for the next generation leaders and their ability or inability to create and communicate a vision and engage others around it. And third was quite surprising: there are very few organizations that were doing anything to develop this competency for not only their executives but their emerging leaders. So, when we rolled up all this data, we walked away knowing that the main priority for leaders is to have leaders who can create and communicate clear vision and engage others around it. The fact that so few organizations were doing anything about this lead to a disconnect that we noticed which generated this specific interest. DC: “Leading With Vision” stresses the importance of connectedness. Why is this so crucial in the workplace? JM: Generation Y is going to make up about 75 percent of the work force by 2025 and as baby boomers continue to age and retire, at a rapid rate, we understand that the generation behind the baby boomers is significantly smaller, at about 11 percent. Therefore, organizations and government agencies are going to need this younger rising generation to compete. What we have found from this is that for these organizations to attract the next generation of A players, they’re going to need to make an emotional connection with them. Visions, for example, are designed to provide people with a compelling reason to make progress toward a goal, and if these leaders are going to be successful then they are going to need to approach the younger and emerging workforce with courage, clarity, connectedness, and culture. These are the four stops of the intersection that is leading with vision. DC: You also mentioned in the book that the CEO of the sports clothing company Patagonia has created a very inspiring workplace dynamic. Can you tell us a little about that? JM: Yes, their leaders, as well as those at OluKai, Bumblebee, St. Luke’s, Oklahoma Gas and Electric, were those who could lead by being bold and vulnerable. That is the essence of it. These organizations had people in the boardroom who stepped up and basically made the shift. From focusing on quotas, quarterly profits, financial statements, to matters of the heart. These organizations recognized that even though it might be uncomfortable to make a transition at first, that they were going to do it anyway. They identified that numbers aren’t a vision and that these next generation leaders knew that if they were going to attract and develop these brilliant young minds, that these individuals won’t be moved by facts, that they need an emotional stake in the game. DC: Can leading with vision succeed in industry such as government? David Annunziata: We think so for sure. When we look at Generation Y and we see how they participate in politics and societal causes they believe in, they’re very impassioned and energized. I think this ties in with how the government has a great opportunity to grab onto Generation Y folks to present a vision that they can make a difference. With our government, I think we are at a turning point to now say, “hey, if you want to make a difference and not just be a status quo person, then you have the opportunity now.” Yes, there’s a little bit of marketing on the government’s part to present that face and to sell it to the folks to believe that this is the right time for them to make a transformation, but his generation is more than ready for it. DC: In your opinion, should leaders in this age be more open to allowing employees to express their creativity at work? JM: If you have people that want to step up to the plate and really come up with a creative and compelling vision, then they’re going to need to be creative in the way they communicate it. And humans are not ideally set up to understand logic. They’re ideally set up to understand stories. DA: I think one of the highlights of Generation Y will be their ability to show they’re creative and thoughtful, that they have the critical thinking skills and problem solving ability to keep coming back to an issue with new approaches. This will separate them from prior generations. DC: What tools do you use when working with federal agencies? DA: There’s an instrument called the 16pf® assessment. It’s a personality tool that has been around for decades, very well renowned. It gives folks who take the test a really good framework about what their strengths are and how they might respond in situations requiring initiative, strategic vision, or teamwork skills. It also shows where their development areas may be hiding. This dovetails into AmIJobReady.com. In a nutshell, users can take the 16pf assessment, find out where they need to improve, and then go through AmIJobReady.com’s interactive videos and tips to become better in these areas. It was built for millennials and younger job seekers to get up to speed quickly in critical workplace skills. Bonnie Hagemann is the CEO of Executive Development Associates, a boutique consulting firm specializing in top-of-the-house executive development and the development of high potentials into senior leaders. Hagemann has over 15 years of experience successfully leading consulting firms through times of rapid growth, acquisitions, economic downturn, and downsizing. Hagemann leads biennial research on Trends in Executive Development, and has 32 published works. John Maketa is the Vice President of Corporate Development for Performance Assessment Network (PAN). As a business leader, strategy advisor, bestselling author, and keynote speaker, Maketa leads initiatives designed to develop skills for next generation leaders. Maketa is a dynamic leader in enterprise growth, developing bold and creative strategic alliances that catapult global performance and profit. He is known throughout the learning and development industry as a major connector who is able to strategically align initiatives for parties on both sides of the table with unparalleled financial and professional success. 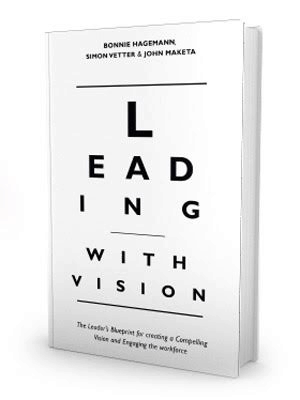 Leading With Vision is a must-read for current and future leaders, entrepreneurs and the curious alike. Please visit http://amzn.to/2ibwp6W to find out more.